Tweet Every girl's dream is to meet her prince charming and walk down the aisle in a designer wedding gown. Well, that's the typical wish-list story for most of my girlfriends from Manila, and having lived all my life in the same city, part of me too thought that would be a perfect wedding story. Fate had something else in mind, and to make my long story short: my husband is from South of France. He came to Manila for business. We were introduced, fell in love and had a long distance relationship. Our engagement was in the South of France (beautiful place!) after 1 year. We celebrated our wedding with close friends and family in Raffles Hotel Singapore after the 2nd year. From a pure Chinese perspective living in Manila, that will make a unique story. But as the world becomes smaller, thanks to technology and direct flights, our "Asia-Europe relationship" becomes a more common story. Having stayed in Singapore for a few months allowed me to meet Eurasian (European+Asian) couples. They always have an interesting story of how they met, how things worked out. For couples like us who come from totally different cultures, we have to always keep an open mind to ensure harmony in the relationship. From my own experience, the one who needed to keep a broader mind is not actually myself, but the people (some friends and family members) around me. All in all, as long as you are both sure and care for each other, love knows no borders. 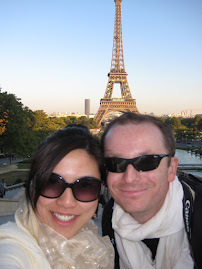 As I embark on my adventure as an expat's wife, I hope to share thoughts and stories. And mostly I guess it's more like an online diary to account our life together and how things unfold as we begin our move. One would think that I would probably have a relaxing life now as compared to my hectic schedules in the past when I was working for HP and Nokia, but since I stopped working last August, the months passed by like a blur! I kept busy with all the wedding preparations plus all the travelling. Just days after our wedding, on November 2006 alone we were in 4 countries... living in Singapore, honeymoon in Bintan (Indonesia), condo hunting in Kuala Lumpur (Malaysia) and visiting my hometown in Manila (Philippines). Quite hectic for an unemployed housewife (ha ha!) But seriously, I never thought I could be this happy (and busy) at the same time, simply being a housewife. I guess there comes a point in your life when career, money and all those branded stuff simply can't fulfill that happiness index. Truly, life's happiness come from things you cannot buy : LOVE, FRIENDSHIP, FAMILY and HAPPY MEMORIES.